Waking up on a winter’s morning to the sweet and savory bouquet of cranberry scones in the oven, can bring us back to childhood memories. Utilizing Quinoa flour transforms these baked treats into protein power. Whisk together all ingredients and store in refrigerator. 1. Place the butter in the freezer for 45 minutes before starting recipe. 3. Mix the lemon juice and coconut milk in a bowl and chill for 5 minutes. 4. Coarsely chop the cranberries in a food processor and set aside. 5.In a large bowl whisk together the brown rice flour,quinoa flour, quinoa flakes,tapioca starch,sugar, baking powder, xanthin gum, baking soda,salt and orange zest. Take the butter out of the freezer and grate it using a box grater. Gently toss the butter into the flour mixture. Do not touch it to much as it will melt the butter. 6. Whisk one egg into the coconut milk mixture. Add this mixture to the flour and butter base and fold with a wooden spatula until it all comes together. Fold in the chopped cranberries. 7. Transfer dough to floured work surface and knead a few times until it comes together. Form a disk, pat it down, and roll it out to a 3/4 “ thickness. Using a 2’’ cookie cutter dipped in rice flour, cut out the scones and place them on a baking sheet lined with parchment paper. Not to close together. Re-roll scrapes and cut again. 8. Whisk remaining egg in a small bowl. Using a pastry brush, brush the top with egg wash. Sprinkle turbaned sugar and quinoa flakes on top of each scone. 9. Bake the scones until golden brown, about 18 minutes. Let them cool on baking sheet for at least 15 minutes. then cool them completely on a wire rack. They keep for up to 3 days. Reheat if you like. 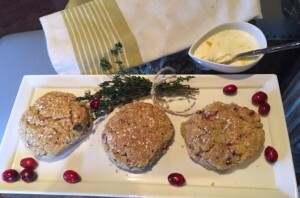 Top each scone with creme fraiche or place in a small bowl with a spoon next to scones.